Beautiful handmade artwork with a true sparkle. Each one is handmade to order using genuine 22ct gold leaf and ultra fine glitter on luxurious 300gsm Tapestry Fabrique embossed card which has a lovely pearlescent shimmer. 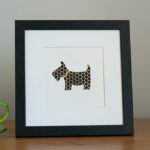 This artwork comes in a choice of glitter colours, is signed and available mounted or mounted with a frame.